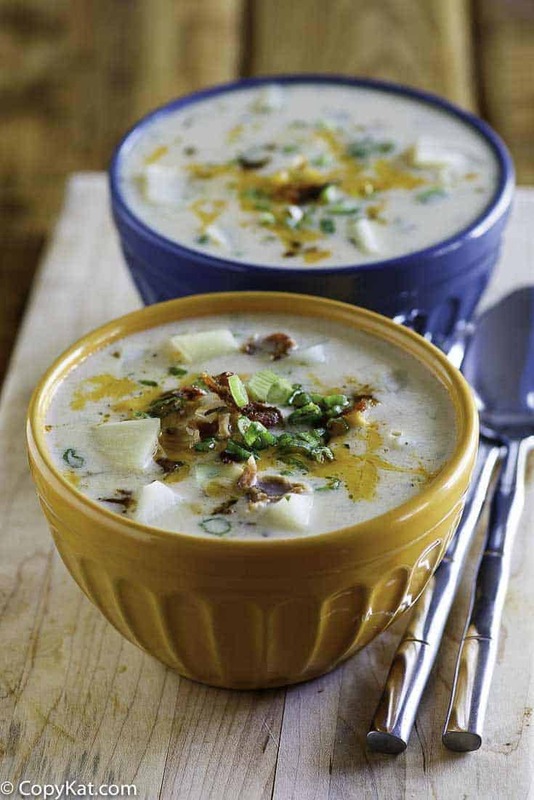 The Hard Rock Cafe Potato Soup is an irresistible creamy potato soup. The Hard Rock Cafe is typically located in resort areas, so if you want a bowl of this soup, chances are you will need to make it from scratch. Everybody loves a good potato soup. Hard Rock Cafe’s Potato soup is famously good. The first Hard Rock Café opened in 1971 in the posh, Mayfair section of London. But it wasn’t until years later that they became known for their rock-and-roll memorabilia. As legend has it, Eric Clapton asked to hang one of his old guitars over his regular table at the restaurant to make it his special spot whenever he visited. When Pete Townshend saw it, he gave one of his old guitars to the restaurant with the note “Mine’s as good as his! Love, Pete.” Today, The Hard Rock Cafe’s collection includes over 80,000 items and is the largest, privately owned library of Rock and Roll memorabilia in the world. The Hard Rock Café introduced Potato Soup to their menu sometime after expanding the restaurant chain into the USA. 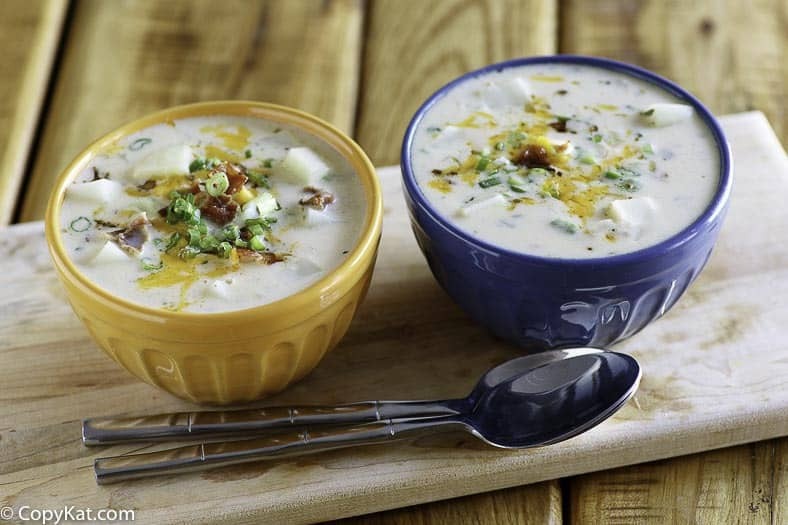 Although the menu changes from location to location, Hard Rock Café’s Potato Soup is often “in rotation” in many of its big-city restaurants during the colder months. One ingredient you may not expect in Hard Rock Café’s Potato Soup is the Tobasco sauce. When making this soup, follow these tips to ensure yours is as good as Hard Rock’s. Bake the potatoes the night before to cut down on preparation time. You can also use equal amounts of leftover mashed potatoes. If you worry about the cheese clumping, toss your grated cheese with 1 tablespoon of flour or cornstarch before adding it to your pot. This will keep it from sticking together. You can also try removing your soup from the stovetop before adding the grated cheese and green onions. The soup should be hot when you add the cheese, but not boiling as the high temperature will encourage the cheese to clump. You can make Hard Rock Cafe Potato Soup just like they make. Chop bacon. Set aside. Cook onions in drippings over medium high heat until transparent. Add flour stirring to prevent lumps. Cook for 3-5 minutes until mixture just begins to turn golden. Add broth (it helps if it is warm) gradually, stirring constantly with whisk until thickened. 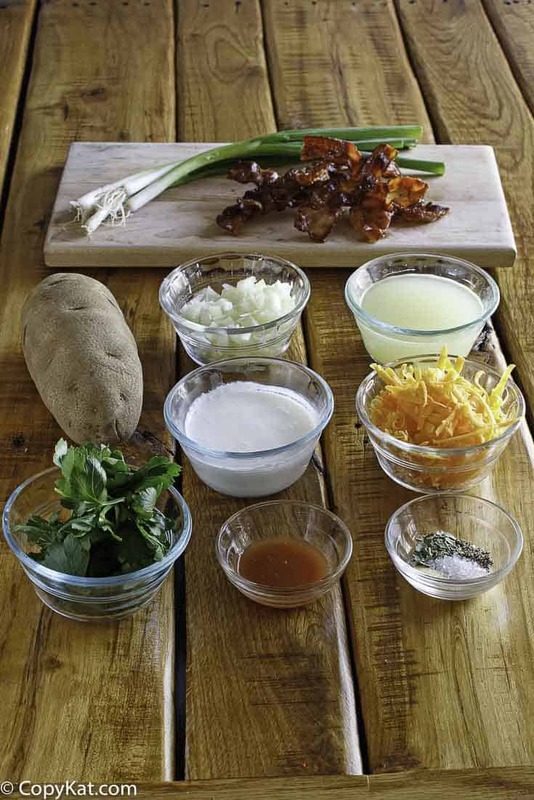 Reduce heat to simmer and add potatoes, cream, bacon, parsley, garlic, basil, Tabasco, and black pepper. Simmer 10 minutes. DO NOT BOIL. Add cheese and green onion. Stir until cheese melts. This can be made ahead up to the point of adding the cheese and onion. Reheat the soup very slowly and gently. Be careful that it does not boil. Then add the cheese and green onion. Of course if there is any leftover it reheats beautifully. I have never tried freezing it. I’ve made this in a roaster pan for many, many events for a crowd for several years, multiplying the recipe x 4.. The first time I made it, it was such a hit, I was asked to make it again… And again, and again, and AGAIN! Peeling and dicing the baked potatoes is the most time consuming part, but WELL worth it! You won’t be disappointed. Unless you’re asked to make it again, and again, and AGAIN! HA! I have also adjusted the recipe to suit me, such as using chopped garlic in a jar, and a tad more got sauce (and I use Frank’s instead of Tabasco). A roaster pan will feed 40 to 50 people at about $1 per person if you buy bacon ends and pieces instead of sliced bacon. Oh wow, I love it when I can feed a ton of people for a little bit of money. Have made this many times too! Delicious! I don’t cook my potatoes ahead just wash and cube up and cook in broth a few minutes….added a little extra broth for cooking potatoes. I also whisk flour in cream before adding to rest of mixture. It always went lumpy adding to the small amount of liquid for sauting onions. We love this soup! I’ve made it many many times. I like to use fresh garlic and cook it with the onions. I also purée this soup in the blender after adding the broth. I also use dried spices and it’s great!! !